Quintessence’s hull is a duplicate of an early 20th century Friendship sloop, Dictator. Her hull was built in fiberglass by Jarvis Newman from a mold Newman developed during the restoration of the original Dictator. Malcomb Pettigrow built out her hull to a Bob Wallstrom design. While Newman’s other hulls were built out as sloops, Quintessence was rigged as a schooner. 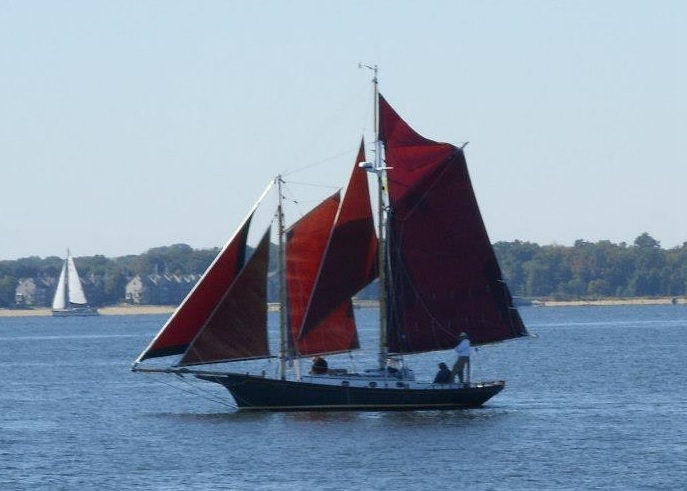 She combines the legendary grace and seakeeping ability of a Friendship sloop with the versatility of a schooner rig designed by Ralph Stanley. She is a truly unique vessel! Quintessence offers sleeping accommodations for four. From the forward V berth, the VacuFlush equipped head is aft to port with a hanging locker opposite to starboard. The main cabin features settees with pilot berths on both port and starboard and a fold down table. The galley is aft and features a 2011 Dickinson 00-2BP two-burner propane stove, stainless steel sink, and a pressurized cold water system. Headroom in the main cabin is 6’. The sole is teak and holly, the ceiling is pine and light is provided by eight brass light fixtures. The electrical system of the vessel consists of a basic 30 amp 110 volt AC shore power system for battery charging and a 12 volt DC system with three marine batteries: a dedicated engine start battery and two house batteries. Two battery selector switches allow engine and house batteries to be used for either purpose if needed. Circuit breaker distribution panels are installed on both the 110v and 12v systems. Offered by Rudders and Moorings Yacht Sales at $55,000. For more information please contact the Broker at 508-679-0414 or via email atjoewalkden@ruddersandmoorings.com. Offered by Rudders and Moorings Yacht Sales at $55,000. For more information please contact the Broker at 508-679-0414 or via email at joewalkden@ruddersandmoorings.com.